your help: we would love to see you at one of the Thomas Fire Sew-Ins, and we would also appreciate any volunteers who can help with sewing and quilting at any other location. Let us know if you are able to help, and we'll find some way for you to help! We have received an outpouring of concern and well wishes from our friends around the world regarding the devastating Thomas Fire and subsequent mudslides. Now is the time to focus that positive energy and creativity to help those whose lives have been disrupted by this record breaking disaster. As of 1/12/18, more than 1,100 structures have been destroyed of which an estimated 775 were single family homes. We appreciate any help that you are able to provide. There are many ways you can help! Bed-size quilts: Please send completed quilts in twin, full, queen, and king sizes in any design. Quilt Backing: We will need large cuts of fabric to back the unfinished quilts. Please send quilt shop quality fabrics in cuts of 4 yards or larger for quilt backs. Wideback fabrics (108" wide fabric) are high on the wish list! Batting: We will need batting for the unfinished quilts. Please send bed size (twin, full, queen and/or king) batting to help us complete the quilts. 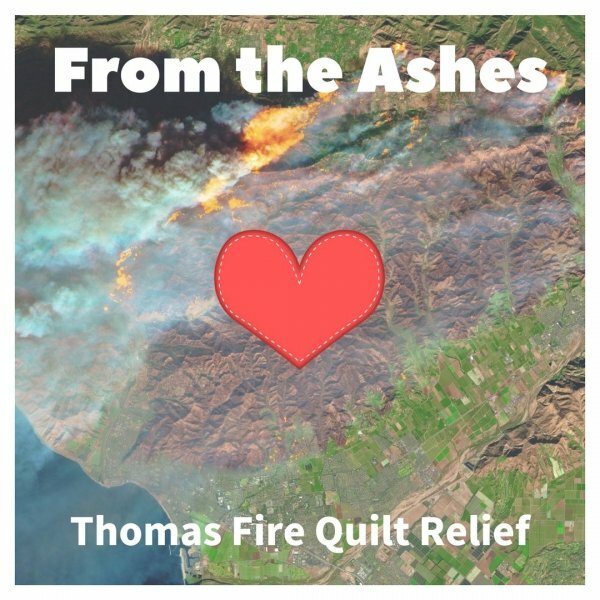 Sewing & Quilting Help: If you would like to help in the assembly and completion of the Thomas Fire quilts, please let us know. We will get in touch and find the perfect job for you! Lastly, if you are in a quilt or sewing guild, or are involved in another sewing group of some kind, please help us to spread the word. Share this web page or our social media posts widely. We appreciate your help in getting the word out!